Preparing gluten-free appetizers can be a bit of a challenge when you are entertaining or hosting an event. It is likely that most of your guests are not going to be gluten-free. There is no need to stress about what to serve: stay true to yourself and your lifestyle requirements. Preparing and serving healthy and delicious gluten-free appetizers is entirely possible. The dishes here are some of the best gluten-free appetizer recipes that are both creative and eye-catching. You might be surprised by how much your guests enjoy the variety that is possible. While you will be putting in some effort, expect to be complimented with the results. Most importantly, have fun preparing the food and enjoy your company. Quiche isn’t just for brunch anymore. Mini quiches are such a popular appetizer at parties and weddings these days. Traditional quiche has a wheat based pie crust that acts as a little cup when served as an appetizer. Quiche can actually stand on its own without the crust. Eggs and cheese blended together are great binders that will hold the shape of the tins they are baked in. No crust equates to less calories than traditional quiche. The spinach and mushrooms in this recipe add a flavorful and healthy spin. Any vegetables you want to use will add appealing color and texture to these little tarts. If you aren’t on the avocado train yet, it is time to buy a ticket. Avocados seem to be on every menu and diet plan these days. This fruit is packed with high quality fats, essential fatty acids, and vitamins. Every healthy kitchen seems to have avocados ripening on the counter. These are so much more than an ingredient in guacamole. Avocados can be used in baking, spread on toast, and rolled up like in this gluten-free appetizer recipe. Whipped until creamy with basil, garlic, lime, nutritional yeast, and smoked paprika it takes on a slightly spicy and herbaceous quality that pairs so nicely with the coolness of the cucumber. This recipe is both gluten-free and vegan. I think everyone on a gluten-free diet misses pizza. There are plenty of gluten-free recipes for pizza. There are also frozen options that you can purchase. Sometimes it is just nice to have a little pizza snack that doesn’t require a lot of preparation or a long baking time. These bite size pizza zucchinis are perfect as a snack or an appetizer idea. This is an easy recipe with minimal ingredients. This is an appetizer idea that is reminiscent of the English muffin pizzas we made as kids. Swapping out the muffins for zucchini as the base makes them gluten-free and much healthier. Gluten-free food does not mean you have to skip all grains and breads. This recipe is a take on a classic BLT sandwich. The bread is replaced by rice paper wrappers. The wrappers are versatile enough that these sandwich rolls can be made as appetizer size or large enough to be served as a main meal idea. There are so few ingredients in this easy roll. The only cooking is of the bacon. The rice paper wrappers just need a quick dip in warm water to soften. These are a lighter version of a BLT sandwich. The avocado gives it that California twist. Any kind of dip is a staple as an appetizer idea. We are so familiar with hummus, guacamole, and the classic sour cream and onion dip. And they are all good. Who would have thought to put chicken in a dip? This gluten-free appetizer recipe for dip is thinking outside the box. The textures of the chicken, beans, and vegetables, layered into gooey melted cheeses and sour cream is genius. Serve this piping hot and bubbling in the skillet right out of the oven and you have a perfect winter appetizer or a complete meal. It will disappear quickly. Everyone likes chips. Here is an appetizer idea that elevates chips and dip. Sweet potatoes are a naturally gluten-free food nutrient dense with vitamins and beta-carotene. What is interesting about these chips is that they are oven baked with coconut oil, adding a really nice flavor to the chips. The creamy dip is made with entirely vegan and gluten-free food items. The thoughtfulness of the ingredients makes this one of the best appetizer recipes. Taquitos are one of the friendliest appetizers to nosh on. Adults and kids alike love them. They are tortillas stuffed with just about anything and fried until crispy. These are the Mexican equivalent of an eggroll. This gluten-free appetizer recipe version is made using corn tortillas. They are stuffed with chicken, cheese, and spinach, and served with salsa for dipping. They are also a great time saving main meal idea. You can prepare the stuffing in advance, roll it in tortillas, and fry them quickly. This is a great gluten-free recipe for busy families and themed parties. A pitcher of sangria might have to be on that party menu. Every time we think of spinach or artichoke dip we are reminded of those hollowed out bread bowls filled with oily dip that is served at chain restaurants. On a gluten-free diet, or any diet, this is not the best healthy appetizer choice. We might want to forgo that version and update it with this gluten-free recipe. The ingredients are simple: Artichokes, spinach, cheese, yogurt, and seasonings. Heat it up and serve it in a real bowl with gluten-free crackers or chips. Now, that was easy. The best thing about layered dips is how easy they are to prepare and how fresh the ingredients are. Layered dips are perfect for a summer picnic or a patio party. The raw ingredients add freshness and texture. One of the best appetizer recipes is for a Greek style layered dip. This one, in particular, is such an easy recipe to prepare. The bottom layer is a creamy hummus that you can purchase or make yourself. On top of that you just pile on fresh vegetables, olives, and feta cheese. In the spirit of being mindful of the gluten-free diet, substitute sweet potato chips for pita chips. This version of onion rings is just as crunchy and light as onion rings made with Panko style bread crumbs. The coconut flakes are what make them so light. These are much different from heavily battered onion rings you might order at a restaurant. You can fry or bake these until crispy. This gluten-free appetizer recipe calls for sweetened coconut flakes. Substituting unsweetened flakes would make the recipe more on the savory side. These are good by themselves with a sprinkling of sea salt right out of the fryer or oven. Or, serve them with your favorite dipping sauce. This recipe for baked zucchini balls uses gluten-free Panko bread crumbs. You can find these at many grocery and specialty stores. The balls are jazzed up with the addition of mint and garlic to the batter. They are baked, keeping them healthier than the more commonly deep fried fritters. The recipe suggests serving them with a yogurt based tzatziki sauce, which really compliments the herbs in the fritters. Edam is the cheese used in the recipe. You could try it with feta for a more Greek style dish. This is one of the best appetizer recipes for a gluten-free party or pre-meal nosh. The potatoes are easy to prepare. While they are roasting, you can concentrate on the exceptional guacamole. It is the star of the dish with the addition of corn and black beans. Topping the guacamole loaded potato cups with fresh radish slices and cilantro adds another textural dimension. The potatoes are sturdy, the guacamole is creamy, and the toppings are fresh and crunchy. The layering effect when you bite into these is sure to wake up your senses. Crab Rangoons are typically wheat won-ton wrappers filled with a crab mixture and then deep fried until crunchy. This gluten-free recipe is a healthier version that is also really fun to make. There is no deep frying involved, and the wrappers have been replaced by a favorite kitchen cupboard snack – the corn chip “scoop”. Scoops are corn tortilla chips that are shaped like a little bowl or purse just begging to be stuffed. You can buy them at any grocery store in the snack aisle. Filled with a crab, cheese, and yogurt mixture, this deconstructed crab Rangoon is a perfect one bite gluten-free appetizer. Here is another recipe that makes use of something we might already have in our kitchen pantry. The recipe calls for a packet of ranch dressing seasoning mix as an ingredient in the batter. Yes, there are gluten-free dressing mixes. You will have to read the ingredients on the label before purchasing. The flour component in this recipe is almond meal. You can find that in most grocery stores now, or it is simple enough to make by grinding almonds in a food processor. Nut meals and flours add a really nice earthiness to breaded food items. While this is a great gluten-free appetizer, it is just as good as a chicken nugget meal entrée for your children. Chickpea or garbanzo bean flour deserves a more prominent place as an ingredient in a gluten-free diet. In India this flour, called besan or gram flour, is used to make flat breads, fritters, pancakes, noodles, curries, and more. This nutty flour has versatile qualities like no other. The French use it to make a gluten-free recipe called panisses, a popular street food that resembles fried polenta sticks. The flour binds well with watery vegetables, like the corn, peppers, and onions in this recipe. The spices make this a very aromatic dish with an intense depth of flavor. This soft pretzel appetizer recipe takes high marks for being gluten-free and vegan. While it does take some time to make, it is worth the effort. Letting the dough rise to double and then cooking the nuggets twice is the key to making these chewy bites. Sprinkled with kosher salt and served with a mustard dipping sauce, these are pretty much the ideal tailgate or Super Bowl party gluten-free appetizer. Turkey may be one of the leanest and healthiest proteins to use in a recipe. The trick is keeping it moist without having to add too much fat. The egg and gluten-free breadcrumbs in these meatballs work to bind the ingredients and give the moisture needed. By grilling the meatballs, they get a smoky, crispy outer shell with a juicy interior. Be mindful of not overcooking them so that they don’t dry out. The lemony cucumber mint sauce adds a tangy moistness when drizzled over the top. Tzatziki dipping sauce rounds out the dish. Every gluten-free kitchen should have corn meal or polenta on hand for meal ideas. This recipe is a really simple polenta that is cooled, cut into rounds, and fried to a crispy exterior with a creamy interior. What make them unique are the toppings. The pesto is made with pistachios. That is a flavor bomb all by itself. But, the sundried tomato and goat cheese layer just takes this little appetizer to the next level. Dressing a simple polenta cake with such rich ingredients elevates an otherwise bland grain dish. Polenta is a good backdrop for a variety of gluten free recipes. Think of it as working with a blank canvas. Sweet potato balls are very easy to make. These are served as a sweet food cart treat in some Asian cultures. They would make a fine appetizer, or could be served as a dessert. Mashed sweet potatoes are mixed with rice flour and sugar, then formed into balls and fried until crispy. To make them more savory, omit the sugar and season with salt. These balls are a good way to get your kids to eat their vegetables. This gluten-free appetizer recipe idea is hearty enough to be a breakfast meal option. It is also well suited for a cool weather party that involves an outdoor activity, like a friendly football match. Its roots are in that childhood favorite Hawaiian Pizza that is topped with the oddly delicious combination of ham and pineapple. In this version, Canadian bacon is substituted for the ham and acts as the crust to carry the sauce, pineapple, and cheese. Similar to the quiche cups, it gets its shape from the muffin tins it is prepared in. These are moist, in a good way, so have plenty of napkins on hand. Are you missing bagels with a schmear and lox? Try these cucumber bites with cream cheese and smoked salmon. This is a healthy way to get your deli fix. They are incredibly easy to make and are one of the best appetizer recipes designed satisfy that topped bagel craving. This recipe has red onion in it, which pairs well with the salmon. If you are worried about the onion being too strong for your guests or children, just leave a little bowl of chopped onion with a small spoon on the side for those more adventurous souls. Or, you could substitute capers for the onions. Quinoa is a high protein seed that behaves similarly to grains in baked dishes. Quinoa binds well with eggs and cheese to make a sturdy muffin with a chewy texture. Because quinoa blooms and expands as it cooks, tiny air pockets form that help make this recipe less dense than flour based muffins. This recipe is a reinvention of an individual macaroni and cheese. Cream cheese and Monterey Jack are wisely paired with the jalapeno peppers for a Tex-Mex style mac and cheese appetizer. Jalapenos aren’t always spicy. But, if you don’t want any heat, try a cheddar and red bell pepper mixture. Quinoa, like chickpea flour, is one of those underappreciated ingredients that should be a staple in the gluten-free kitchen pantry. Here is a recipe that will satisfy your dairy free, grain free, and meat free sensibilities. Twice baked potatoes are another one of those chain restaurant offerings that comes to the table dripping with fat and often piled high with cheese and bacon. Yes, that does sound tasty. Your heart will thank you for this lighter version that is packed with just as much flavor. The almond milk and olive oil provide just enough of the moisture, protein, and fat needed. You will feel so much better and equally satiated after eating this version of a twice baked potato. The vegetables add fiber, crunch, and color. The title of this appetizer recipe is enough to wake you up and take notice. Bang Bang refers to the sauce, not the cauliflower. The finger food sized cauliflower is simply prepared in a batter of gluten-free Panko breadcrumbs and eggs, and then baked in the oven. While the cauliflower is baking, prepare the dipping sauce that is infused with hot and sweet flavors. Cauliflower is bland, another blank canvas. The sauce brings life to this otherwise flavorless vegetable. Bang Bang Sauce is the star here. It can be used as a dipping sauce for any appetizer dish. You can also use it in a main dish recipe over zucchini or rice noodles. Wow, another Bang Bang recipe. This recipe pays homage to the Asian style of deep frying using corn starch in the coating for the shrimp. Korean fried chicken and shrimp are often prepared gluten-free using corn starch to form the crusty outer layer. Here, there is a combination of cornstarch and gluten-free breadcrumbs. The liquid binder is coconut milk. Coconut milk is rich, creamy, and imparts a distinctly Asian or island flavor to the dish. It has just enough fat to add richness without being unhealthy. The Bang Bang dipping sauce in this recipe is super simple to make. Here is a gluten-free appetizer recipe that really grabs your attention. These spring rolls are fresh, colorful, crunchy and relatively easy to make. You will have to spend a little time slicing and dicing some rainbow colored veggies, but the outcome is so pretty. The dipping sauce has only 3 ingredients. These will be a big hit with your vegan friends. Corn dip is another truly easy recipe. It is featured on several recipe blogs as being one of the best appetizer recipes. As the name implies, it is simply addictive. The ingredients can be found in any market. Canned corn and shredded cheese make this a snap to prepare. Fresh cilantro gives the dip the herbal kick it needs. Serve it warm or at room temperature with corn chips. One thing to remember when working with gluten-free foods is that we must read the ingredients on the label or package, as mentioned before. This recipe reminds us that soy sauce is wheat based. Tamari is made without wheat, so that is what is used in this satay recipe for both the marinade and the sauce. Another cool ingredient here is the almond butter in place of peanut butter. This appetizer is great for a pool party or a barbeque. Char the chicken to get some grill marks and impress your guests. Here is another one of those gluten free appetizers that is packed with protein. It is also vegan. Mixing quinoa with hummus is a good way to get the protein needed in a vegan diet without piling on the beans and tofu. These rolls are a complete meal idea in one little package. You have fruit (red pepper), vegetables, and protein all rolled together. If using a store bought hummus, choose any flavor that you prefer. Quinoa tends to absorb whatever flavor it is paired with. This recipe calls for sundried tomato hummus, which has a bold concentrated tomato flavor. The quinoa mellows out the tomato so that it doesn’t overpower the dish. Say that 10 times fast. It does sound yummy. As summer winds down, the fruits and vegetables at the farmer’s market start to look a little bit smaller each week. Farmers are picking everything they can before the first frost; so much of the produce selection is young, like baby zucchini and sweet baby bell peppers. Those tiny peppers are a perfect substitution for jalapenos to make poppers. Not everyone cares for the heat of jalapeno peppers. This gluten-free popper recipe omits the breading and the deep frying. They are baked. You won’t miss the breading with the addition of the crispy bacon. This is another one of those best appetizer recipe ideas. The platter can be made entirely of gluten-free food. This one includes a sundried tomato hummus, black olive tapenade, and goat cheese stuffed bacon wrapped dates. The recipes for each of these are spelled out. 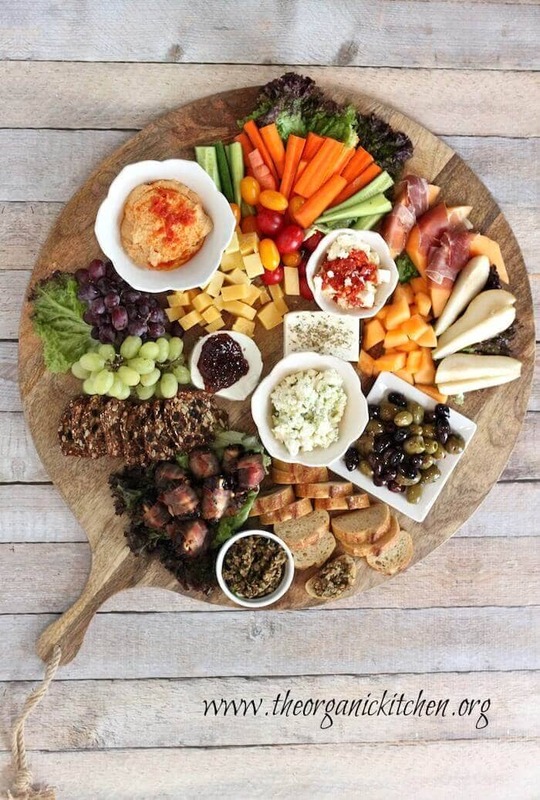 The rest of the platter is made up of cheese, vegetables, meats, fruits, and your choice of gluten-free breads and crackers. With a nice bottle of wine you have a complete meal idea happening. This is ideal for sitting around the table with friends and good conversation. To make these meatballs a gluten-free recipe, you can use gluten-free Panko breadcrumbs. Chicken works well here because it tends to have a little more fat content than turkey. These stay relatively moist. What makes them firecrackers is the sauce. It has hot chili sauce and red pepper flakes in it. The heat is offset a bit by vinegar and brown sugar. The sauce hits every note of sweet, sour, salty, and spicy. There are 2 schools of thought on what type of flour makes the best tempura batter. Some batters are made with wheat flour. Some use rice flour. This recipe adheres to the rice flour preparation. The batter is thin, allowing the vegetables and shrimp to be front and center of the dish. For a thicker batter you could add cornstarch and this would still be a gluten free appetizer recipe. Although tempura is fried, it is an appetizer that isn’t lacking in the goodness of vegetables and lean protein. Serve these little tarts as either an appetizer or dessert bites. The cheese makes them savory, while the fruit makes them sweet. Afternoon tea comes to mind when reading this recipe. Easy is an understatement here, making this another best appetizer recipe. The recipe calls for packaged gluten-free pie crust that you can find in the refrigerator section as the base for each tiny tart. Just add brie, jam, and a blackberry to each. Bake and serve. You are likely to be tempted to test a hot one right out of the oven before your guests get their hands on them. Go for it. Riced cauliflower is a gluten-free food good for anyone on a low-carbohydrate and grain-free diet. It is often used in place of plain white rice, or in a pizza crust. In this recipe the cauliflower rice is pre-baked or steamed so that it is more like a mash that resembles bread dough after the moisture has been removed. Cauliflower is yet another one of those foods that absorbs whatever flavor it is paired with. In this recipe, a Tex-Mex cheese blend is what gives the breadsticks intense flavor. The hot breadsticks are dunked in tomato sauce. Children will love this recipe. Risotto is a dish that requires some attention. While it is a lovely gluten-free diet staple, you might only make it on special occasions. Italians have a great way of using leftover risotto, so making a double batch can give you a meal one night and an appetizer a day or two later. Italians call their leftover risotto appetizer arancini. Arancini is a fried ball of breaded risotto that is often stuffed with a little surprise of cheese or meat. This particular risotto ball recipe calls for cheese and vegetables to be mixed right into the rice while it is cooking. So, enjoy an elegant main course of risotto one night and you will have the makings for a quick appetizer to fry up and serve with marinara sauce the next day. This easy recipe for pizza bites gets another vote for being one of the best gluten-free appetizer recipes. It is a little sneaky. These are very basic pizzas made with packaged ingredients. The best part of the recipe is the crust. It is simply store-bought gluten-free white bread rolled out flat and cut into a circle to fit inside muffin tins. The prep time for this recipe is maybe 15 minutes. There is no excuse not to try this one out. Shrimp and guacamole work so well together on these tostadas. What makes the shrimp so tasty is the chipotle seasoning. The only cooking involved is sautéing the seasoned shrimp for about 3 minutes. The rest is minor assembly of tostada + guacamole + shrimp – a super easy recipe. These bite size tostadas can be served cold or at room temperature. They would be great for a Cinco de Mayo party. A wheel of baked brie cheese is a winter holiday favorite appetizer recipe. It is that time of year when you just might have to allow yourself an indulgent treat. You can restart your diet in January. Have you ever noticed that holiday gift baskets often contain wheels of cheese, fruit, and nuts? These foods just work well together. Add in some honey and you have a rich and decadent appetizer. Serve apple or pear wedges with the piping hot brie topped with nuts and honey. Mmmmm. This is a classic Caprese salad of tomatoes, mozzarella, basil, and a balsamic drizzle. Making it into a crostini by layering the ingredients on top of a crispy gluten-free cracker makes this the quintessential appetizer for an end of summer party when the basil is trying to bloom and tomatoes are at their sweetest. Slicing and layering is something you can assign to that one person who always lingers in the kitchen while you make the balsamic reduction. Every party has a person or a few who like to hang out chatting with the chef. Put them to work on this easy recipe. They can’t mess it up. Finally, a recipe with pork other than bacon! A Gluten-free diet doesn’t mean you have to limit your animal based proteins to chicken and turkey. Pasture raised pigs generally don’t eat grains and are very lean. Heritage pork is raised on acorns that fall from trees. Yum. You would be surprised how much of our farmed poultry, fish, and beef are fed a grain based diet. Think about it. Do you know if your proteins were fed gluten? The pork based meatballs here are pimped out with Asian herbs and spices, as well as sriracha. The crunchy slaw is a nice raw accompaniment to the meat. This is a really fresh take on a lettuce wrap that is usually not much more than spiced ground meat with peanuts as the crunchy component. These cucumber bites rise to the top of the charts as being vegan, Paleo, low-carbohydrate, allergen free, gluten-free……am I leaving anything out? You can make this with homemade or prepared guacamole. It is a very simple appetizer idea that you don’t need to overcomplicate. It is recommended that you use the English style hot house cucumbers. They have less seeds, the skins are less tough, and they always seem to be the perfect diameter for one bite appetizers. At least your dish will look symmetrical. The kick and pop of color in this dish idea is the sprinkling of chili powder on top of the guacamole. You may think of chicken salad as a main meal idea or recipe, especially for lunch. Chicken salad works really well as a dip or crostini topping for an appetizer course. Fruit and nuts are fairly common ingredients in chicken salad recipes. While just a suggestion, adding curry powder to this gluten-free recipe will enhance the sweetness of the fruits and the earthiness of the toasted nuts. The recipe swaps out some of the mayonnaise for plain yogurt. Having tried this mayo/yogurt combination, it is an excellent idea that plays nicely with the sweet fruit. Bacon wrapped anything may take you back to the 1960s. Trader Vic’s served Pupu Platters that consisted of appetizers very loosely derived from Polynesian recipes. Though, pupu platters have few or no gluten-free appetizers as options. Rumaki was one of the items sometimes found on a pupu platter. It was water chestnuts wrapped in bacon and sugar, broiled until the bacon was caramelized. It was good and still is. This version calls for pineapple instead of water chestnuts and turkey bacon. The pineapple infuses natural sweetness into the bacon. The sour element is form Apple cider vinegar. These disappear fast. It seems as if every catered party has a server walking around with a tray of sliders. By the time you get your hands on one they are often cold and a little dry. These neat little burger bites come with the works, sans the bun. I think the toppings are what keep them moist. They do take a little bit of effort to prepare and assemble. But, it is worth it for how festive they look and taste. The dressing is light and tangy because it calls for Greek yogurt instead of mayonnaise. Appetizers that arrive on a toothpick are easy for your guests to handle. These pizza roll treats were designed for toothpicks. The combination of cheeses in this recipe is what makes it so tasty and creamy. The textures are really smart here. The cheese is creamy, the pepperoni is chewy, and the olive has a little snap to it. This is another easy recipe. Though, you may have to hone your piping skills to get the cheese to look like the work of a pastry chef. As long as they taste good, I don’t think anyone will notice. While on a gluten-free diet you don’t have to skip the fun foods. This gluten-free appetizer recipe is a reconfiguration of a corn dog. Corn meal and gluten-free pancake mix is the base for the breading that surrounds the hot dog pieces. These are baked in muffin tins rather than deep fried in oil, making this recipe a bit healthier. Kids love pigs in a blanket, and these are pretty close to the original recipe. You could serve these quite simply with dipping bowls of catsup and mustard. They would go great with cold beer at an Oktoberfest party. You can’t do gluten-free appetizers without considering a stuffed mushroom option. Most stuffed mushroom recipes are loaded with bread crumbs. This recipe doesn’t use any, not even gluten-free versions. The mushrooms are stuffed with a cheese and hot sausage mixtures and baked. These can be made ahead of time and baked right before serving or can be kept in the freezer for when you have unexpected guests and need to have something to serve in a hurry. Small cherry or Campari tomatoes, like new potatoes and button mushrooms, are the best edible vehicles for anything you want to stuff them with. They are naturally bowl shaped. Tuna salad stuffed tomatoes is a fairly common luncheon offering, or maybe it was a few decades ago. This recipe uses shredded chicken salad as the filling. You could use either salad mixture. Plain yogurt gives the salad tartness and celery adds a nice crunchy element. These are truly one bite appetizers with no grains. Here is the best meal idea for persons with a variety of food sensitivities. I call it a meal idea because, while these bombs make great gluten-free appetizers, they are hearty and filling enough to have as a main course. The recipe calls for gluten-free vegan crescent roll dough that is stuffed with vegan cheese, pepperoni, pizza sauce, and zucchini. They are baked until the dough is crispy. This dish will satisfy your pizza craving for sure. Being on a gluten-free diet does not mean that you have to give up your favorite dishes and feel deprived. There are so many options available now to enable you to recreate popular recipes without the gluten. Many of these recipes do a really good job at reimagining their original counterparts without sacrificing the flavors you are accustomed to. Most of the gluten-free appetizers featured here are recipes that are quite easy and worth trying. You can always tweak them to your liking. Bon appétit.